Advanced Bionics provides the world’s most advanced cochlear implant system to help you or your loved one hear again—or experience the joy of sound for the first time. Hearing loss affects millions of people of all ages around the world. For many, hearing aids provide a viable solution, but if you or a loved one experience significant hearing loss, hearing aids may offer little or no benefit. That’s when it’s time to consider cochlear implants, a medical device technology that thousands of people around the world rely on, as a way to restore hearing. A cochlear implant is a highly advanced medical device and the only technology that is capable of functionally restoring one of the five senses. Cochlear implants provide an effective alternative to hearing aids because they don’t use amplification. Instead, they bypass the damaged part of the ear and use electrical stimulation to enable you to hear. What are the components of a cochlear implant system? 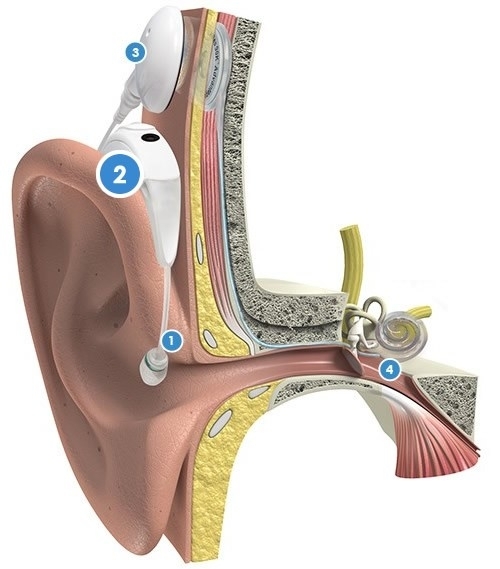 There are two main components to a cochlear implant system. The internal component is the implant. The external component is the sound processor, which can be worn on or off the ear. First, the cochlear implant system captures the sound around you, with one or more microphones. AB has microphones placed in the front and back of the processor and in the headpiece. Unique AB microphone technology allows you to use ear buds, headphones and telephones like everyone else, to hear in water, and to hear better in noise. Learn more about the T-Mic™ 2 microphone and the AquaMic™ headpiece. When the sound is captured, it is processed. AB sound processors use the industry’s most advanced technology to make hearing easier and include the only sound processing strategy in the industry recognized by the FDA to improve speech understanding in noise. Learn more AB’s industry-leading sound processing. The processed sound is transmitted through the headpiece to the implant. AB’s implant family features the most advanced sound processing circuitry in the world, with programming flexibility that provides nearly unlimited ways to deliver sound. The sound is sent through an electrode directly to your hearing nerve. 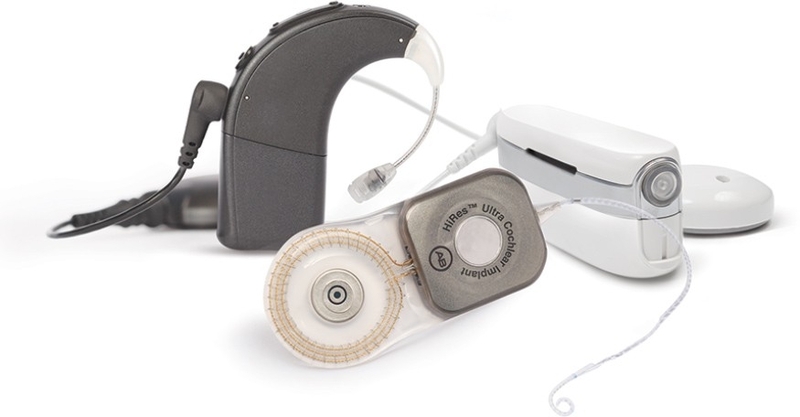 Every AB electrode delivers focused stimulation through current steering technology – available only from AB – for hearing that more closely resembles normal hearing. Learn more about AB’s implant and electrode technology. Click on the numbers in the illustration below for more information. What can I expect to hear? The best way to learn about what recipients and their loved ones experience on their journeys to hearing is to talk to people who have already taken the journey.HearingJourney™ online forum is the biggest online community for people touched by cochlear implants and hearing loss. Since 2007, HearingJourney.com has been the premier place to chat, laugh, learn, and share stories about cochlear implants and hearing loss. You will find participants happy to answer your questions and share their experiences with you. How much do cochlear implants cost? The cost of cochlear implants varies due to local distribution and currency differences, as well as availability of insurance reimbursement. Please contact a local AB representative for pricing information in your area. How can I improve my hearing and understanding? The more you practice, the better you’ll hear. As you go about your day and listen to the sounds around you, you are training yourself to hear with your cochlear implant. You can help the process along with training and rehabilitative exercises. Younger children often make great progress working with speech therapists and other hearing professionals trained to help develop listening skills. Advanced Bionics provides a range of unique, specially designed resources for recipients of all ages to enhance your ability to hear in challenging situations and recognize words and sounds that can be more difficult to distinguish. 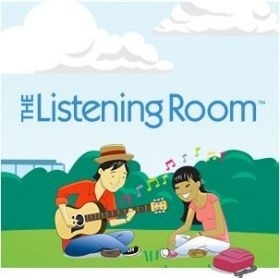 You can explore and make use of these resources at TheListeningRoom™ rehabilitative website. Designed to help you hear in noisy settings, from bustling restaurants to busy airports. Compatible with cell phones, MP3 players and other audio devices. Talk on the phone or sing along to your favorite song! Easy to use… there’s no need to fumble with tiny batteries, dials, switches or remote controls. Flexible, with different wearing options to suit your needs, from a lightweight on-the-ear option to a discreet processor that can be concealed under clothing with nothing worn on the ear at all. Eco-friendly, with rechargeable batteries that are easy to operate and last for years. How do I know if cochlear implants can help me? You may find that you are not hearing as well as you’d like with hearing aids. You may be struggling to hear in noisy settings, to talk with loved ones on the phone, to listen to your favorite songs, or to contribute your talents at your workplace. Are You a Candidate for Cochlear Implants? I have difficulty following conversations without lip reading. I hear pretty well in quiet environments, but struggle in noisy environments or when in a group. I cannot follow most telephone conversations, especially if I don’t know the person calling. I feel isolated and limited, both socially and occupationally, because of my hearing loss. If you checked one or more of the above, then you may be a candidate for Cochlear implants. Thank you for completing the cochlear implant candidacy questionnaire! Your results show that you might be a candidate for cochlear implants. Please fill out the quick form below and a AB representative will reach out and answer any questions you may have. We can also put you in touch with individuals who have been through this process already so you know exactly what to expect. We look forward to getting to know you!